Two new, holiday-themed silver coins from the Royal Canadian Mint are available at their face value. They also sell tax-free and ship free in Canada and the United States. There’s the $25 Winter Fun Silver Coin for $25, the $20 Gingerbread Man Silver Coin for $20, or both in a subscription for $45. "Makes a unique and thoughtful holiday gift for children and adults alike, and an excellent addition to any collection featuring Canadian or holiday themes," the Mint describes of the coins’ product pages. These coins have common specifications despite their different face values. They share a maximum 200,000 mintage, a purity of 99.99% silver, a weight of 7.96 grams, a diameter of 27 millimeters and serrated edges. They also have matching obverse or heads side designs of Susanna Blunt’s effigy of the Her Majesty with inscriptions of ELIZABETH II and D G REGINA. 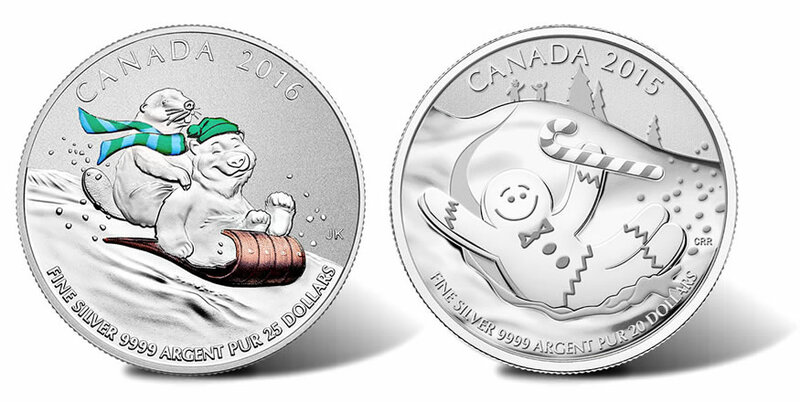 2016 $25 Winter Fun Silver Coins offer a reverse design by Jesse Koreck that shows an animated beaver and polar bear sledding. Reverses of 2015 $20 Gingerbread Man Silver Coin, designed by Chris and Rosina Reid, depict the gingerbread man sliding down a snow hill with a candy cane in his hand. Order either coin or the two-coin subscription from the Royal Canadian Mint website at www.mint.ca. You may also use this affiliate link .